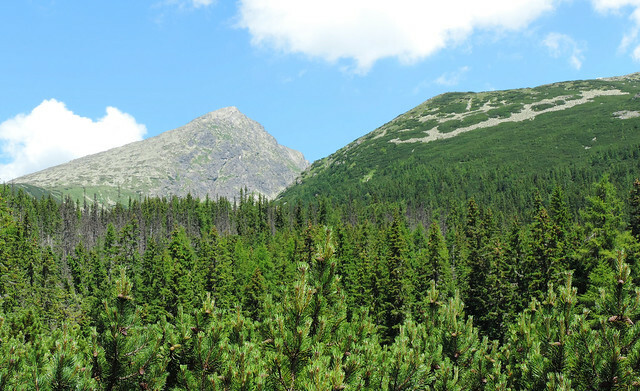 Slovakia’s Tatra Mountains has a symbolic peak: Kriváň. They say that every Slovak has to conquer Kriváň peak at least once in their lifetime. We couldn’t argue. Rather we would extend this principle to non-Slovaks, too. 🙂 Because Kriváň is the most beautiful peak of the High Tatras! Kriváň’s characteristic shape reminds us to a horn and it offers a 360-degree view which is among the best ones in Slovakia. By the way, Kriváň was voted to be one of the imagines on Slovakia’s euro coins. 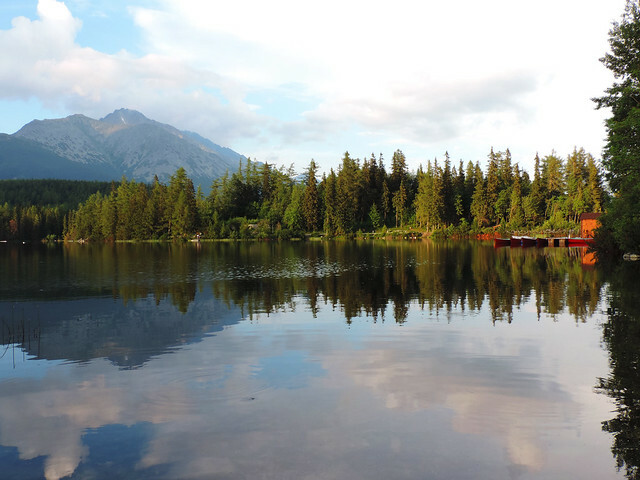 The trail starts at Strbské pleso which is the most popular and most accessible lake in the High Tatras. It’s a starting point for several trails, you need to look for the red route if you are aiming Kriváň. 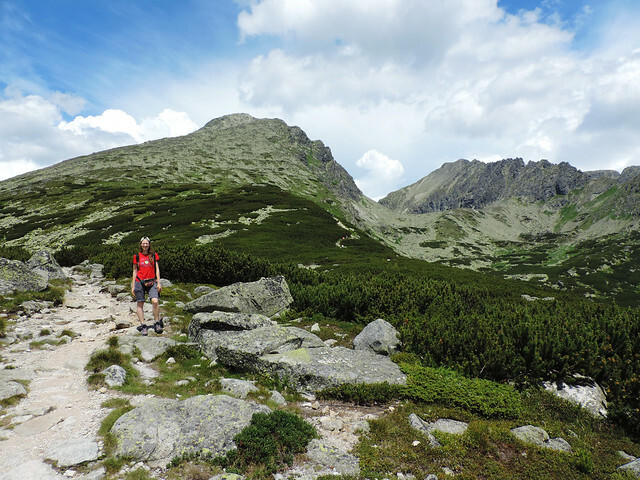 The red route took us through forests and meadows to Jamské pleso. Jamské pleso is a small, somewhat hidden lake with distant views of the high peaks in the background – including Kriváň. It’s a nice picnic spot and you better refresh yourself a bit there because that’s where the relatively easy first section of this hike ends. The junction of the red and blue routes is right before you reach Jamské pleso so we had to walk back there from the lake (a serious 5 minutes long walk). Then we continued steeply uphill on the blue route towards Kriváň. No worries about routes after that point because the blue routes takes you all the way up to Kriváň. All we had to do is enjoy the panorama which became more and more beautiful after each step. Oh yeah, and we had to steeply go up but that’s obvious. Kriváň is 2495 meters high after all. 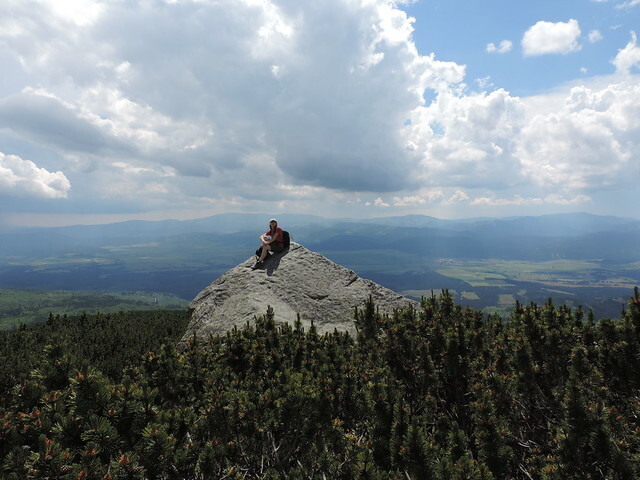 Soon we could see the whole Western and Low Tatras below us and the high peaks became closer and closer. Then we reached Malý Kriváň (1671 m) and we realized we shouldn’t call the hike up there steep because then how do we call the section after that? 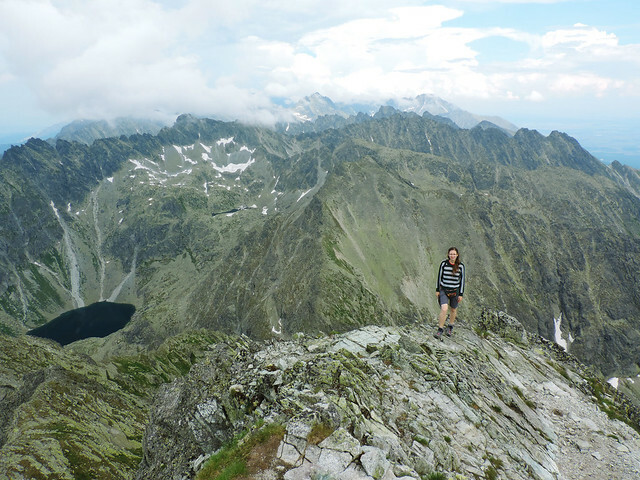 Reaching 2495 meters and thrilling views! What comes after Malý Kriváň became the new definition of steep. It’s not even hiking rather climbing the rocks in this last section on a narrow ridge towards the peaks. But don’t worry there’s no sections there which are secured by chains… Uhm… Actually, we would have been happy to have chains to hold onto for some parts of the route. 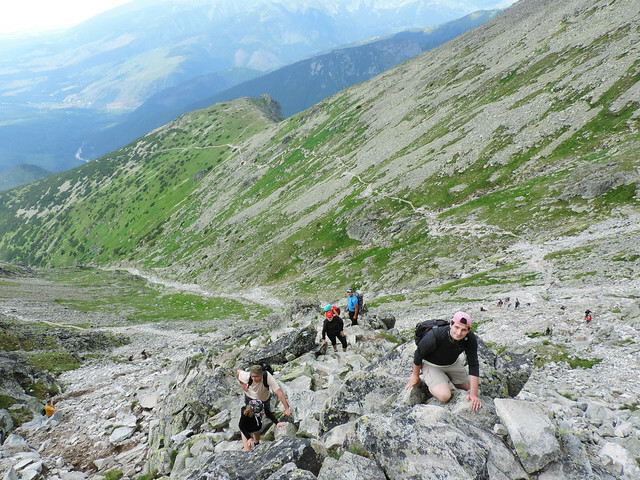 And while there are chain secured sections on other hiking routes in the High Tatras, the route to Kriváň has no chains. That doesn’t mean it’s dangerous – well, hiking itself is dangerous, actually, you know, high peaks, deep ravines… But it was only that dangerous what we could still handle. And those views what we got is really worth fighting for! Almost every significant peak of the High Tatras can be seen from Kriváň including Rysy, Lomnický štít and Gerlach, the highest peak of the Carpathians. 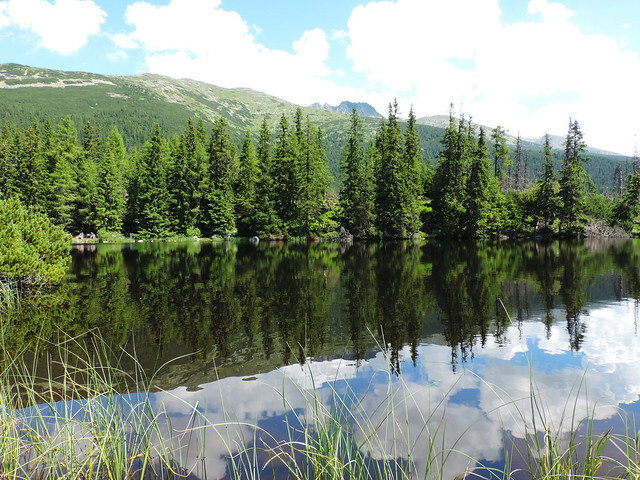 In addition, several alpine lakes hide between the peaks and they look like crystal clear ponds from Kriváň. So we had a bunch of excuses to have a long rest stop at the top. Then we started our climb downhill on the same route and by the time we reached Strbské pleso it was almost sunset time. Strbské pleso is the nicest on a calm late afternoon! After a lot of our hikes we ended up at Strbské pleso and we just sat down on the lakeshore and stared at the reflecting peaks and contrasting colors. A perfect ending of any day. The best time for hiking up to Kriváň is a perfectly sunny summer day. 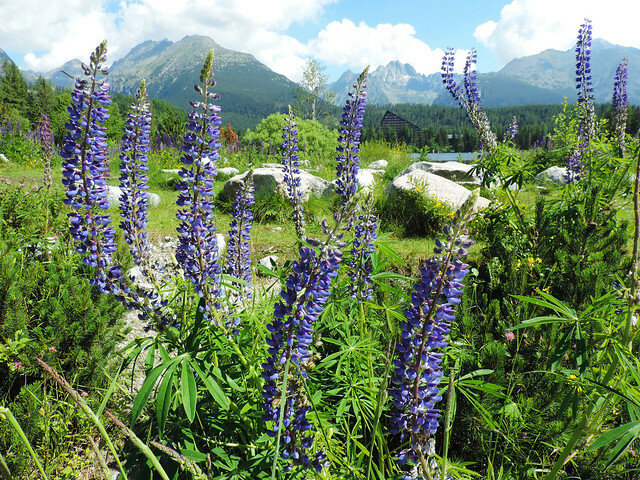 Summer is the hiking season in the High Tatras anyway and most trails are open from the 15th of June to the end of October. A sunny day is harder to predict though. We recommend checking the weather forecast very often as weather is quite unpredictable in the High Tatras even in summer. We decided beforehand that we would only start the hike to Kriváň if there’s barely any clouds in the sky in the morning and a clear day is forecasted. So we skipped the hike once and then aimed for another day that we hoped will be clear and sunny. At second we had luck. But if weather conditions are bad, it’s a really dangerous hike! Especially the last section is very slippery and the last thing you want is to be caught by a thunderstorm at the top. Would you challenge yourself with this hike? Do you have a favorite mountain peak to climb?